All transactions are safe and secure with a reliable history in online purchasing behind each of our associates. 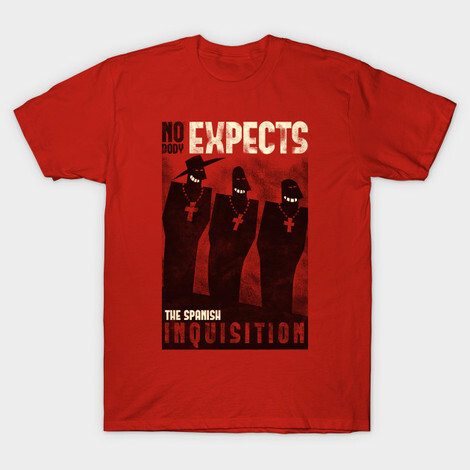 Buy the Monty Python Spanish Inquisition t-shirt to own Monty Python clothing and merchandise. "Nobody expects the Spanish Inquisition" is a quote from a recurring bit on the Flying Circus TV show. It plays on the popular saying that people use when they feel like they're being questioned too much or unfairly judged. During such moments on the show, the actual Spanish Inquisition appears. These Monty Python t-shirts are something completely different. Wear the tee as you eat Spam or practice silly walks. In addition to the Monty Python Spanish Inquisition tee above, browse the Monty Python Clothing Gallery for more apparel like men's and women's clothes, kids shirts or hoodies.